Over 8 months, on average, we heard from 146 people per week. 148 people, representing seven stakeholder groups, engaged in testing the foundations and developing actions for the Strategy. In Phase Two, a workforce discussion paper and survey for school staff was also released. 18% work in independent schools. Stronger collaboration with the community to enable inclusion of all students. A greater focus on citizenship, social responsibility and wellbeing. Almost 1 in 10 comments mentioned a desire to develop schools as community hubs, and a need for more integrated support. Measurable wellbeing, learning achievement and growth. More than 1 in 10 comments from parents, families and carers related to equity for all students including gifted, disadvantaged and other minorities. Stronger connections with universities to bring their expertise into our schools and to strengthen initial teacher education. 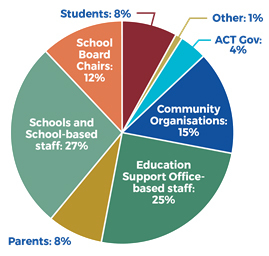 16% of comments from the community sector called for greater consistency across schools. There should be a focus on wellbeing and support of school staff.